Are you feeling the Christmas spirit, or are you overwhelmed with all the wishes, traditions, and lack of time? I know this time of year can be especially overwhelming for a lot of people. I enjoy decorating, family traditions, and all the things that this season is 'supposed' to be, but I know it can be a tough time of year for many. I hope you know, dear friends, that my house is not perfect. I enjoy sharing projects and inspiration with you, but I never want people to mistake a staged photo for reality. Normally my dining room table is covered with projects and dust. But it is nice to give it a break from that, and pretend that we are ready at a moment's notice for guests to dine here. The dining room really stayed pretty close to how we normally have it, I just added in a mix of fresh and faux greenery. 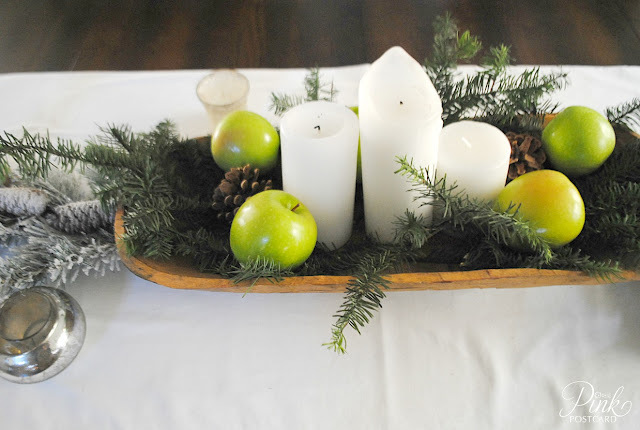 Our wood bowl got a transformation from fall, and has white candles, fresh apples, extra greens snipped from the Christmas tree. I kept our white monogrammed runner on the table. I added more fresh greens and a few extra decor pieces on top of the hutch. These fragrant mini rosemary wreaths were added to the hutch doors, with some French stripe ribbon. These really were very easy to make, and took about 5 minutes to put together. You could do this while watching TV in the evening. First, I took a round cylinder vase that was about the diameter around that I wanted for the wreaths. You could use a bowl too. 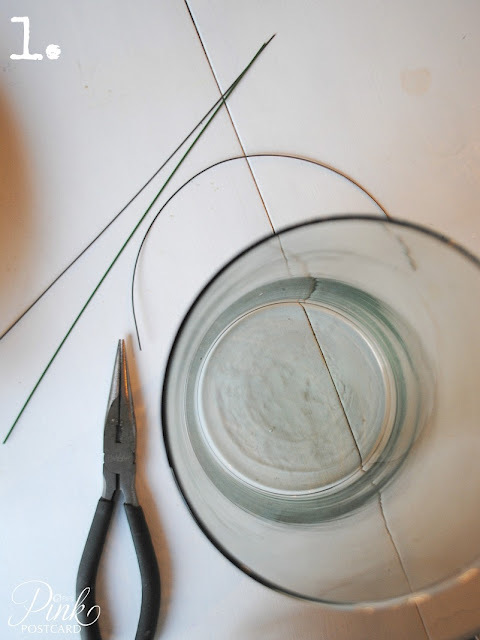 I bent one wire around the vase. Using your needle nose pliers, bend the tips of the wire into small U shapes. Hook the ends together and crimp the ends in to close them. 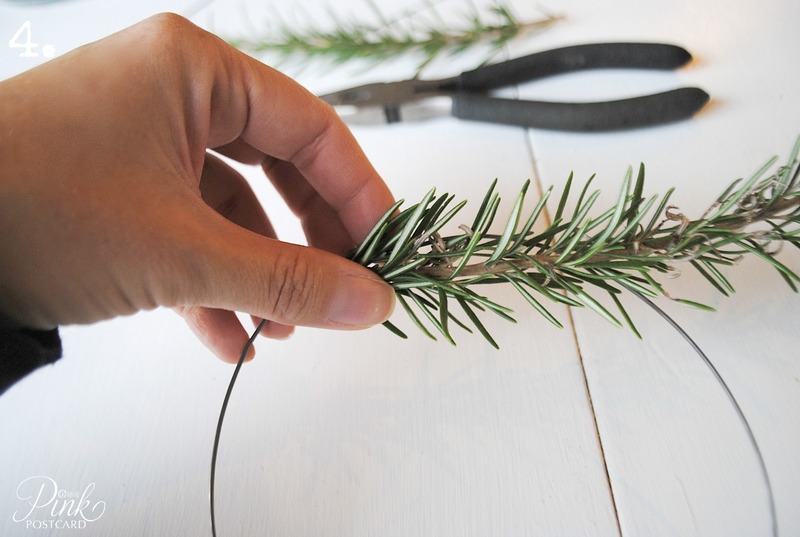 Taking one sprig and a 2" piece of thin wire, lay your rosemary on the round form and wrap the sprig with wire so that it is snug to the O shape form. Twist the wire around so that the wire is completely encircling the sprig. 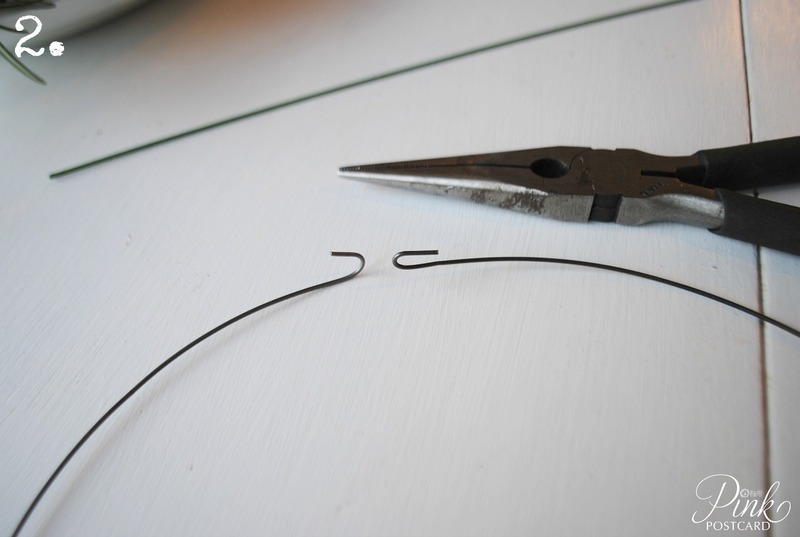 You can use your pliers to finish crimping the ends, so you don't hurt your fingers. About 2" from the end of the first sprig, overlap with a second piece of rosemary so that you have a continuous section of greenery without gaps, and covering the wire. 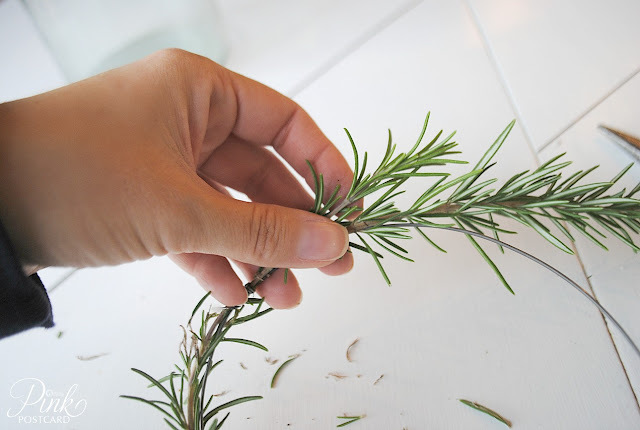 Keep going around the form until your rosemary is covering the form. 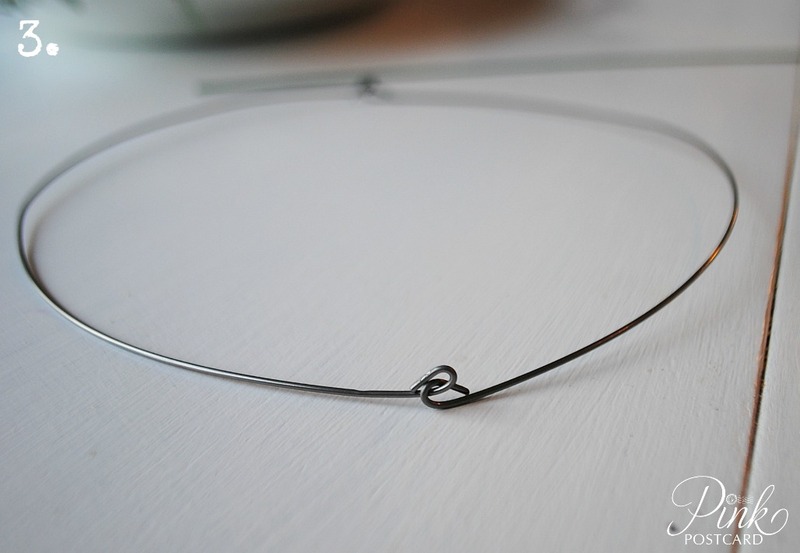 It's ok if you squish some of the leaves with the wire that is holding it in place. The leaves will cover it anyway, and you will be releasing the wonderful fragrance of the leaves by bruising them. did you know that in Medieval days, women would comb their hair with rosemary to perfume it? This project is super simple, fast, and brings the wonderful smell of the holidays into your home. 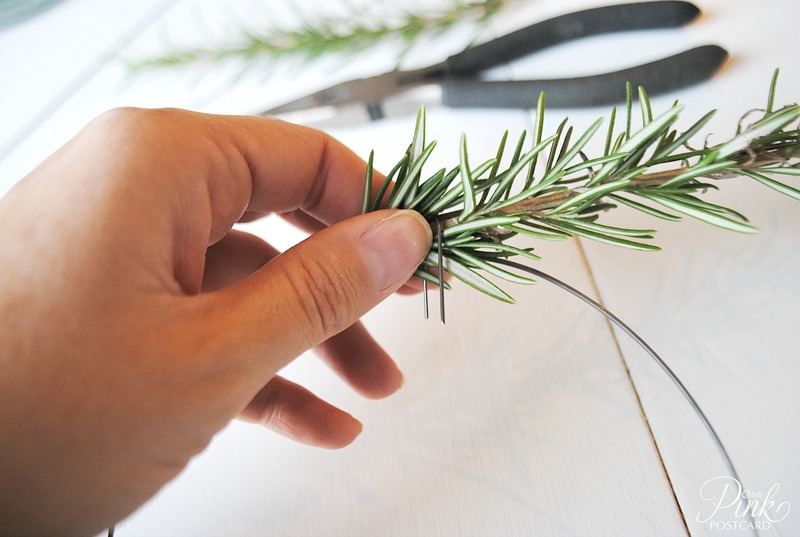 You can get rosemary plants at a home improvement store, nursery, or even your grocery store! They are very hardy, as long as they don't get water logged. They also make a great potted plant. These wreaths will last for awhile- if you want to have them looking their best, spritz with water every few days, and you will have a wonderful, fresh wreath through the holidays. Enjoy the little moments of this season, friends. 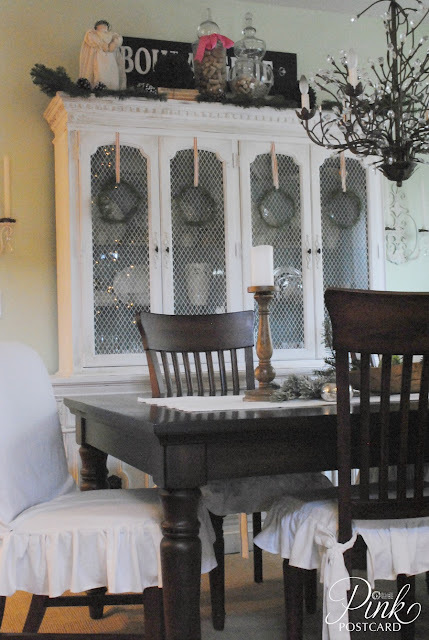 Your dining room is so pretty, Denise! I love your chair slips. I made white ones for our dining area chairs earlier this year, but took them off for Fall and Winter. I do like how yours look and maybe I'll put mine back on for Christmas. 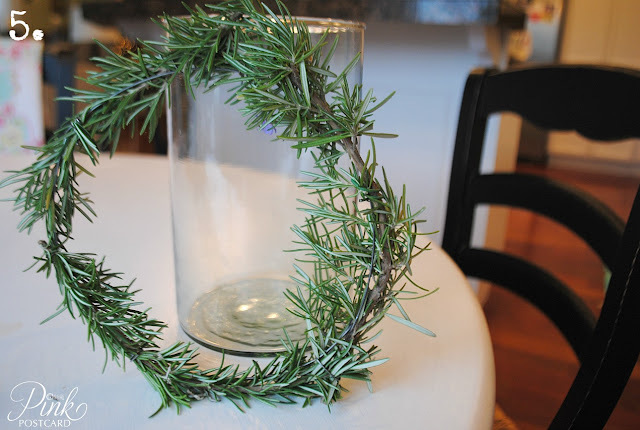 I adore rosemary and I am using bits of it in my Christmas decor. I love your simple wreaths. Great idea with the rosemary. I absolutely love the smell of it! One if my fav's so I grow it every year. I'll have to save some to use as decor somehow. I really like this dining room. Very impressive, though modest your wreaths of rosemary. Loving the pretty rosemary wreaths!!! 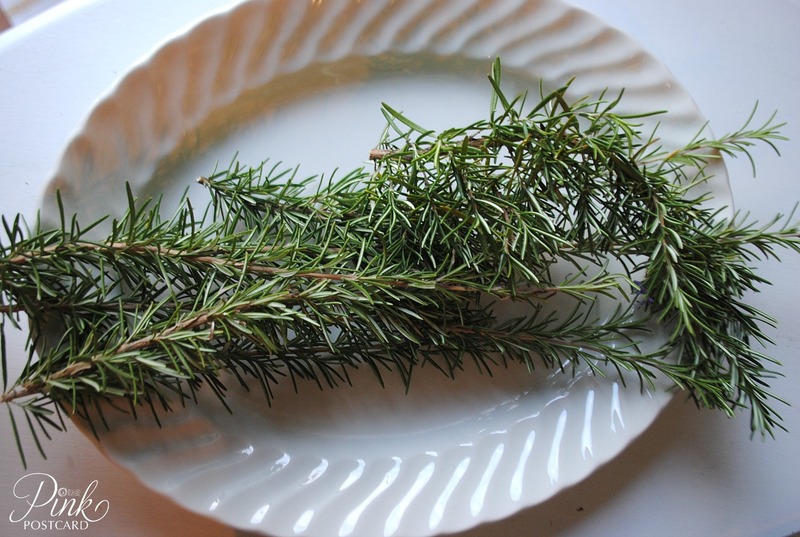 Nothing better than the scent of Rosemary! Your dining room is beautiful. Your dining room is beautiful! 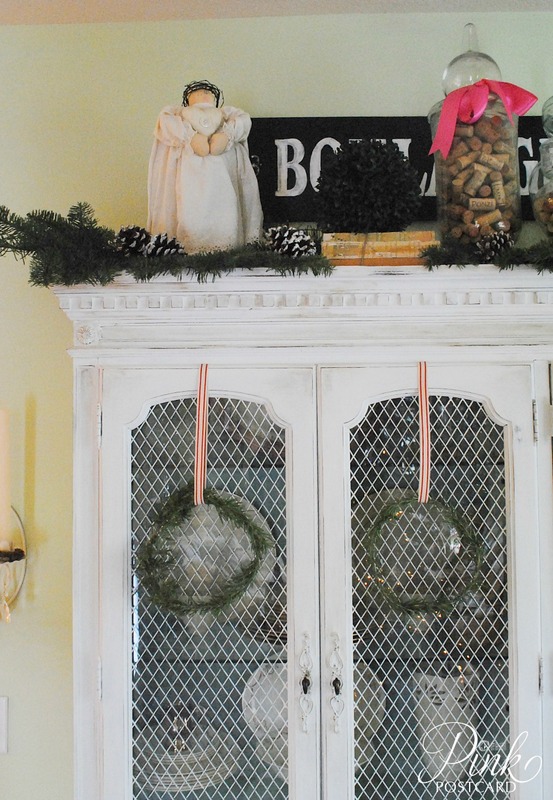 I love the idea of the rosemary wreaths. I have some in the yard. I will give this a try! Your dining room looks lovely the rosemary is a great idea. I can imagine the smell. ahhhhh, i have rosemary! i need wreaths! perfect. Lovely! If I find the time I just might make some of these! Beautiful! Thank you for joining me at Home Sweet Home and have a Merry Christmas! THese are so cute Denise. I will have to think of those for next year. Thanks for linking up, hope you are having a great week. 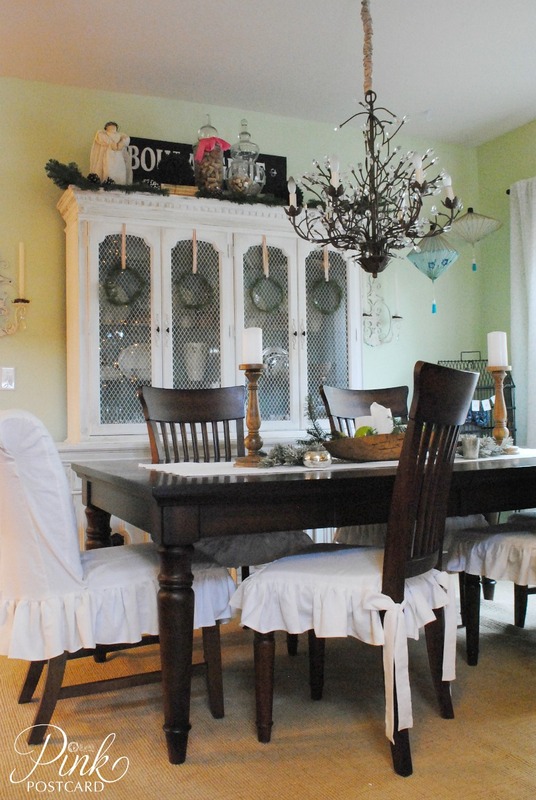 Your dining room looks beautiful, Denise! Your hutch is gorgeous ( I think you were lucky that it didn't sell in your booth....lol)! I really like the little slips for your chairs. Did you make those? I've been toying with doing that in my dining room as my furniture is very dark pine and having 6 chairs around a large table gives the appearance of way too much darkness! I love those rosemary wreaths -- wonderful smell!